WHAT: Temporary ban, with leeway to expand it, extend it, alter it, as time passes. Explicitly interpreted by Steve Bannon, White House nationalist (I mean strategist) to INCLUDE green card holders. WHO: Citizens of seven Muslim majority countries. The text mentions religious minorities, and Trump has made the case repeatedly (as well as incorrectly) that Christians were unfairly shut out of refugee status and immigrant visas. Christians are a fraction of the population in those countries, and so they are (logically) a fraction of the number of visa recipients. In Iraq they are only 5% of the population but have received 16% of the visas. 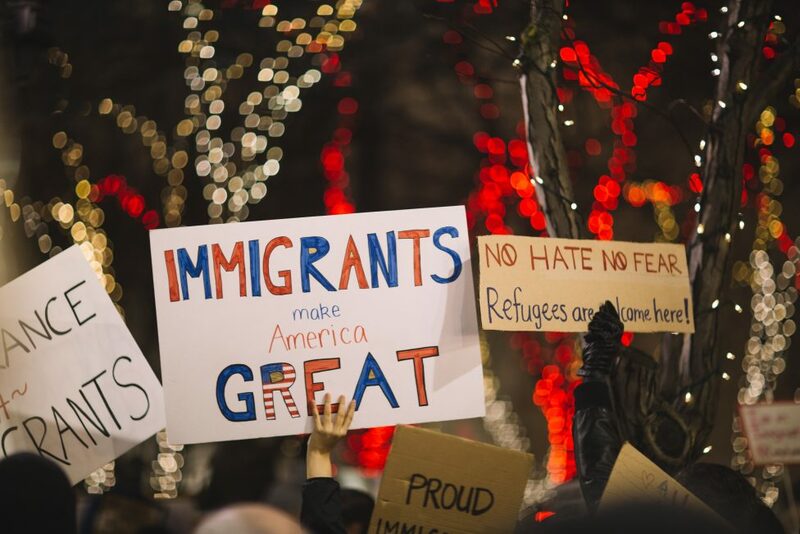 Those who were barred from entry included – and continue to include, until DHS is stopped from implementing the ban – are students, Iraqi interpreters, the elderly, family members of those in the U.S., all refugees and all new immigrants. What do they have in common? They’re from those seven Muslim-majority countries. It is a blanket ban. Can we just get something out of the way right now? Obama’s very different experience in 2011. BTW: I’m so tired of posts that say, Obama did it in 201X and no one said a damn thing! The reason I’m tired of hearing those is that they are time wasters: someone has found something in the past that they say is the same as Trump and they post it. But they don’t fact check, they just put a picture and a headline and a link, and act like they’ve just proven that Obama was the same as Satan. Well LOOK, the cases couldn’t be more different. Limited, thoughtful, vetted, policy for a narrow purpose that was then curtailed when the purpose was achieved. And double BTW? That PURPOSE was increased vetting, after the U.S. intelligence community found that two Iraqis previously involved in construction of IEDs had made it into the U.S. Obama’s action sealed that leak. WHERE: Seven Muslim-majority countries that have NOT sent citizens to the U.S. to commit terrorist acts. Those countries that HAVE sent people to the U.S. to commit terrorist acts are exempt for now. There were three attacks, according to the NYTimes article mentioned above, involving these immigrants, none fatal, though of course any attacks are horrifying and we don’t want them here. 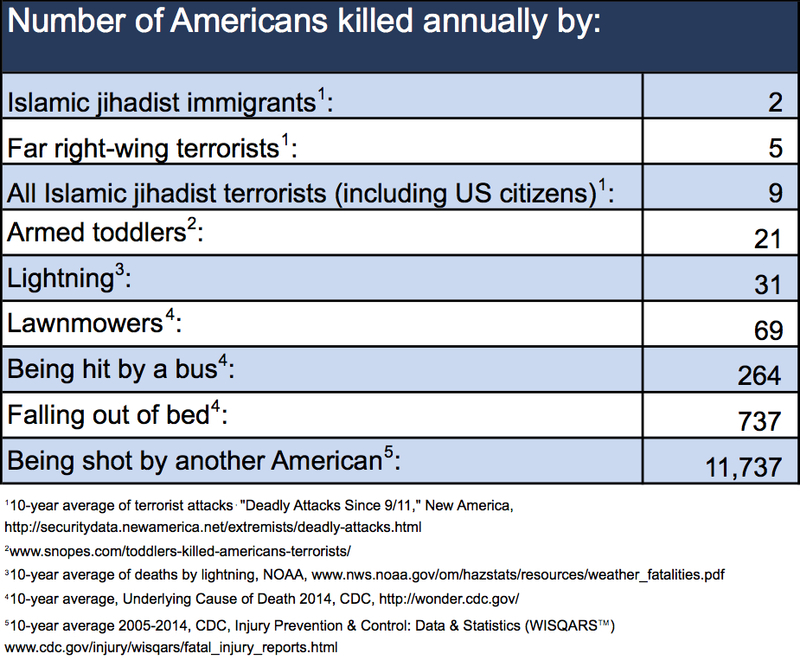 But white nationalists have been responsible for both more attacks and more deaths, please see here, here and here. I don’t know why someone’s furniture might rise up like that, or how the injuries would end up being fatal, but I’d watch out for that. At least as vigorously as I would watch out for terrorist attacks on our home soil. But I would feel more comfortable if we could see legitimate furniture attacking figures from the CDC. WHEN: At the end of Trump’s first week in office, coinciding with the Friday news cycle (typically the slowest news day of the work week.) DHS officials, having not been involved in the creation or in the plans for implementation of the EO, were as surprised as anyone, and attempted to begin enforcement on a weekend under conflicting guidance. WHY: Thiiiiiiis is where it starts to get interesting. 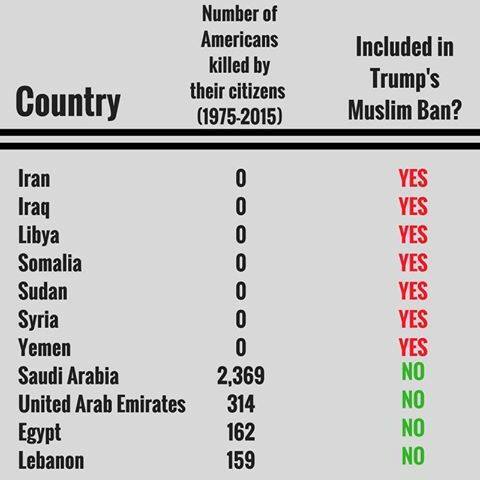 This is where we start to say, hmmmm (to quote Kevin)… is it a Muslim ban, or isn’t it? The Why certainly has to do with Trump’s campaign promise to ban Muslim entry into the U.S., even if the current EO does not say it explicitly. His first week in office has proven that he is pushing just exactly those issues he promised before the election, through EO if not yet through legislation. As readers of my work know, I believe in strong counterterrorism powers. I defend non-criminal detention. I’ve got no problem with drone strikes. I’m positively enthusiastic about American surveillance policies. I was much less offended than others were by the CIA’s interrogations in the years after September 11. I have defended military commissions. On the over-inclusive side, it will keep tens of thousands of innocent refugees who have been subject to unspeakable violence outside of the protection of the United States on the vanishingly small chance that these people might be terrorists—indeed, to make it impossible for them even to apply for refugee admission if they are Syrian…. It overtly treats members of a particular religion differently from other people. On the underinclusive side, the order wouldn’t have blocked the entry of many of the people responsible for the worst recent terrorist attacks. There is, in fact, simply no rational relationship between cutting off visits from the particular countries that Trump targets (Muslim countries that don’t happen to be close U.S. allies) and any expected counterterrorism goods. One might argue, I suppose, that the document [the EO] is tied to current threats. But come now, how could Pakistan not be on a list guided by current threat perception? ….Yes, it’s temporary, and that may lessen the costs (or it may not, depending on the outcome of the policy review the order mandates), but temporarily irrational is still irrational. ….When do you do these things? You do these things when you’re elevating the symbolic politics of bashing Islam over any actual security interest. You do them when you’ve made a deliberate decision to burden human lives to make a public point. In other words, this is not a document that will cause hardship and misery because of regrettable incidental impacts on people injured in the pursuit of a public good. It will cause hardship and misery for tens or hundreds of thousands of people because that is precisely what it is intended to do. …a thorough vetting system can remind senior policymakers that the audience that will assess the morality and effectiveness of their proposals hails from all parts of the domestic political spectrum — and from nations around the globe. After all, humans are nobler when we think we are being watched. …in the rational pursuit of security objectives, you don’t marginalize your expert security agencies and fail to vet your ideas through a normal interagency process. You don’t target the wrong people in nutty ways when you’re rationally pursuing real security objectives. Rudy Giuliani’s involvement – as he eagerly commented on FoxNews – tells us that the process included Trump’s insistence that Giuliani’s commission find a “legal way” to ban Muslims. At the same time, Steve Bannon, the White House strategist maligned above, made it clear that green card holders were included in the ban. He had to reverse this later, but the whole episode smacks of a “shot across the bow” to see what the Administration could get away with, who its “friends” were, what the response would be from citizens and activists. This is too damn long now so in lieu of a concluding with fierce rhetoric about how I feel about this, I will just let the facts stand for themselves.